In the nut of iron material, I searched for stainless steel with insufficient strength and used it. It became possible to maintain the place that could not be maintained with iron material. It was good. This review is about item#42115272. This time, I found that there are various types of wing nuts, but the cold wing nuts were very solid and I was able to repair the table safely. This review is about item#42115306. I was very satisfied with the quality, but I was lost for a while because it was divided into 3 packs in quantity. I thought it would be easier to buy a few packs of 2 or 4 even if the price change did not change. Because the "wing nut" of "steel rake" of the self-governing association is sometimes disengaged "+ Appset washer built-in (semus) bolt P-2 5M" together. Also, I think that a caulking agent should be applied to the tip of the bolt so that it does not come off. This review is about item#42115297. Although I ordered 2 packs, only one pack was sent and I was impatient, but as soon as I called you sent me. I am satisfied with the quality of the product. This review is about item#42115315. 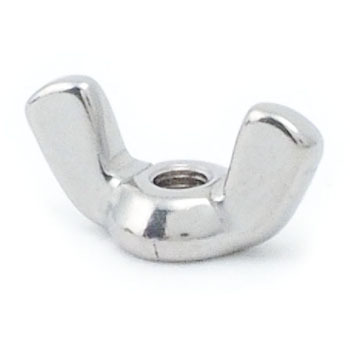 I think that bolts and nuts are also sufficient as it is not inferior to other manufacturer's products. Satisfied with quick delivery. Regarding the product itself, there is no particular dissatisfaction. Since the dimensions were described in detail, the object of the desired one was available. Making is also good. Neither appearance nor support strength, any one could be used without any problem. This review is about item#42115324. It seems that there is no problem with accuracy and strength. I do not know about lifespan. When I was using an electric three-wheel haulage vehicle on the mountain road, the nut was falling down beforehand. When asked to the purchased company, it seems that time and shipping cost will be applied to part fitting, so it was uneasy whether to match the pitch etc. on the net, but since it is a set of two, I dared to buy it. I am satisfied with fitting perfectly. There is weight compared to the steel plate system, I think that the corners become rounded and easy to use. A small amount of packed goods is saved. Goods also have no problem. It is serious, it helps. I used it for my work. It just helped a lot. Thank you. It is an ordinary butterfly nut. I use it as a substitute for the thing currently used. It was satisfying it was a beautiful product. I would like to continue to purchase it next time. Thank you very much. This review is about item#42115333.